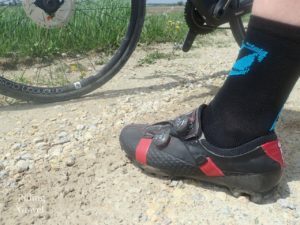 Bont Vaypor G Shoes: At The Finish- by Guitar Ted The seasonal changes we experience put this final verdict on the Bont Vaypor G shoes off the burner and on hold for a few months. One thing these shoes are not and that is Winter capable in the Mid-West. So, I pushed pause and started in riding these again when it made sense to. Here then are the final thoughts I have on these high performance slippers for gravel road racing and riding. 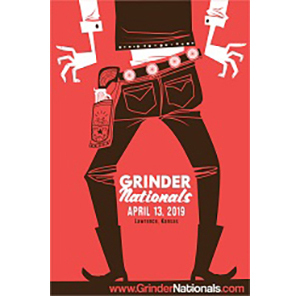 If you’d like a refresher on the previous thoughts I had please check out the “Getting Rolling” and “Checkpoint” posts by clicking those titles. The Bont Vaypor G shoes on a recent warm ride. These are definitely NOT Winter shoes! The break in using these shoes over the Winter brought a different perspective on them once warmer weather came along. My impressions were again of the stiffness, the lightness of the shoes in the hand, and how airy they are while riding. Yes, the wind comes right through these things, so if it is cooler and you have feet that tend to be cold anyway, you may want to keep a nice pair of wind covers or Winter over “booties” to keep the little piggies toasty. So, other than that I can reiterate that these aren’t really the greatest, or even very good at all, for walking in for very long. Let’s say you have a mile section of unmaintained, muddy road to walk, or a hike-a-bike section in a more remote, mountainous area to traverse. Well, the task will bring a strain on the legs as your feet will be inflexible. It is a very unpleasant feeling after a little while. That is balanced out again by how efficient the soles of the Vaypor G shoes are while you are on the bike. So, in instances where you might be called upon to do some walking, I would probably opt for another shoe in the closet. But for anything else requiring full transfer of power, say a race where the chances of getting off the bike are slim, this shoe will provide the most efficient platform you can pedal against. Super-efficiency appeals to certain people. I know it just doesn’t play well with some folks needs or physical attributes. I am one that does not prefer anything “locked down” to my feet. I like a little “wiggle room” in my shoes. So, I never did the heat-moldable process, since I knew I wouldn’t be attuned to that. The shoes out of the box fit well enough, and the toe box was big enough, that wiggle room was good. In fact, I learned not to clamp down the Boa closures very tightly as well, since that didn’t play well with my feet either. So, maybe this shoe really isn’t the best thing for me in the physical sense, but I noted a definite boost in efficiency anytime I pedaled with them on my feet. The best compliment anything for a bicycle can get is that they “disappear”. That was mostly how I thought about these shoes while I was riding. There were a few times I was aware of these shoes though. That would be when I was remarking to myself how the Bont’s would make me more efficient, and then whenever I got off my bicycle, I instantly became aware of these shoes. To be fair, I compared these to an older, “pre-S Phyre” version of Shimano’s top of the line XC MTB shoes. I actually found the Shimano shoes to be better to walk in, but these older shoes have a completely different sole/footbed, which isn’t as efficient as the Vapor G shoes are. So, The Bont’s have ultimate efficiency. And I thought those Shimano shoes were super efficient. I guess you have to give up something for that, and that appears to be walk-ability. At The Finish: The final verdict doesn’t vary much from my last post on these shoes. so…. The Bont Vaypor G is a shoe for the high performance minded rider that is looking for efficiency but not at the cost of on-bike comfort. That said, don’t think about walk-ability when looking at these shoes. Bont is unapologetic in saying that the Vaypor G is not for such pursuits. These shoes are made for riding bicycles. They are heat moldable, but fit so well that you may not have to use this feature. The Boa closures afford an adjustable fit while riding. Light, efficient, and airy when it is hot out. These are the good things about the Bont Vaypor G shoes. I don’t think a more efficient, yet comfortable while riding shoe exists. I sure know it doesn’t work the best for the occasional hike-a-bike. 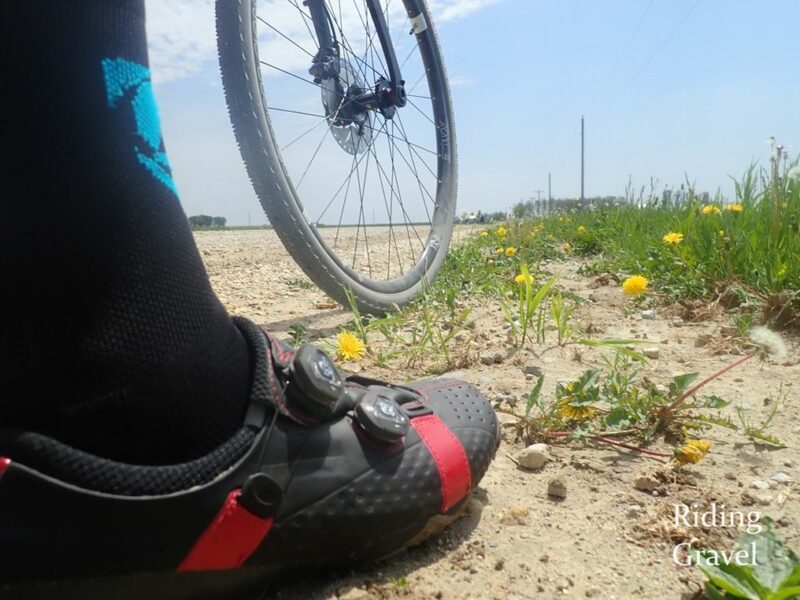 So, if you are an all-out racer, have courses that rarely require off the bike adventures, and love getting the best power meter numbers that you can get, the Bont Vaypor G shoes should be high on your list of shoes to check out. Note: Bont sent the Vaypor G to RidingGravel.com for test and review at no charge. We are not being charged nor bribed for this review and we will strive to give our honest thoughts and opinions throughout. Great review, but it does beg the question – if the choice is between these and my road shoes, what is the advantage of these? @Dan- Traditional road shoes? Well, IF you have to walk/hike-a-bike, it would be better in the Bonts vs a traditional road shoe. Otherwise, stiffness being the same? Not much. @Dan- And thanks for reading the review! Glad you enjoyed it. @Joey Brown- The toe box is generously proportioned, but not a lot more than a typical width Shimano shoe. Just bought a pair to replace my Vaypor Road Shoes. Will be using these for all my tarmac and gravel going forward.